My wife I had a superb return visit to New York City this week. On Sunday we flew into that sunset over Manhattan and enjoyed a gorgeous view of The Empire State and Chrysler buildings from our hotel. On Monday we explored the High Line, Chelsea Market, Soho, Central Park and 30 Rock. So great. On Tuesday, I led a sketchnote workshop at mcgarrybowen, an ad agency in Chelsea, NYC. I taught sketchnoting techniques and guided students as they created idea generation sketchnotes and sketchnoted a video. After lunch, I built up their visual thinking skills for ideation sessions. What a blast! 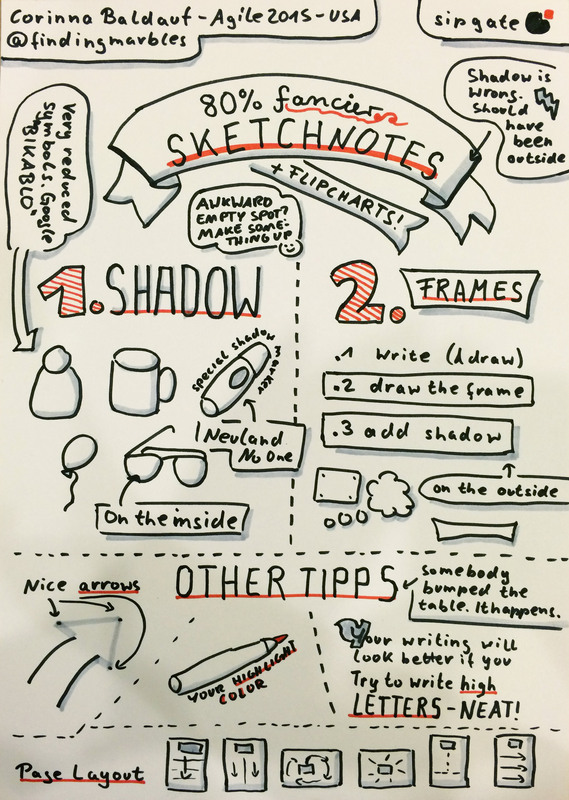 Spots are still available at the Sketchnote Workshop in Kansas City, Saturday, August 29! Yes, you can still attend the Kansas City Sketchnote Workshop on Saturday, August 29th, in partnership with Coffee & Design. Sign up for the Sketchnote Workshop for $75, which includes a sketchnote kit, breakfast, lunch and coffee. Bring yourself — we provide the rest! Use code CROSSROADS for $15 off the $75 price of the workshop! I teach private sketchnote workshops at places like University of Michigan, mcgarrybowen in NYC and Sibley Hospital in DC. I'd love to teach sketchnoting to your team too. Email me and let's talk. ♥ 5 Ways Doodling Improves Learning & Creativity - Anna Dabrowska shares how doodling helps you process, retain, and share information. ♥ How I use my notebooks - Jenny Mason of The Finer Point shares what notebooks she uses and how she uses them (via The Cramped). ♥ Rocketbook: Cloud-Integrated Microwavable Notebook - Rocketbook is an IndieGoGo project to create a re-usable notebook you can erase in the microwave and comes with a mobile app for capturing your notes. ♥ 80% Fancier Sketchnotes - Corinna Baldauf of Wall Skills created a handy poster of tips for creating 80% fancier sketchnotes. Download the big JPG. ♥ How It’s Made: Videos of Space Pens, Colored Pencils, Fountain Pens and More - You might fall into a YouTube hole with this collection of videos from Ana of the Well-Appointed Desk. You've been warned!